For other uses, see Hermopolis (disambiguation). "Hermoupolis" redirects here. For the cargo ship in service 1947-66, see SS Hermoupolis. 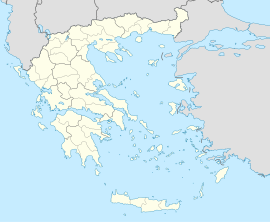 Ermoupoli (Greek: Ερμούπολη), also known by the formal older name Ermoupolis or Hermoupolis (Greek: Ἑρμούπολις < Ἑρμοῦ πόλις "Town of Hermes"), is a town and former municipality on the island of Syros, in the Cyclades, Greece. Since the 2011 local government reform, it is part of the municipality Syros-Ermoupoli, of which it is the seat and a municipal unit. It is also the capital of the South Aegean region. The municipal unit has an area of 11.181 km2. Ermoupoli was founded during the Greek Revolution in the 1820s, as an extension to the existing Ano Syros township, by refugees from other Greek islands because of the War. It soon became the leading commercial and industrial center of Greece, as well as its main port. The renowned Greek Steamship Company was founded in the city in 1856. Thousands of ships were built in the various Syros shipyards. Eventually Ermoupoli was eclipsed by Piraeus in the late 19th century. In the following decades the city declined. Recently, its economy has greatly improved, based on the service industry. Panoramic view of the harbour. The Cathedral of Saint Nicholas, patron saint of the city. Wikimedia Commons has media related to Ermoupoli. This page was last edited on 1 February 2019, at 10:58 (UTC).